For the unincorporated community, see Alabama Hills, California. The Alabama Hills are managed by the U.S. Bureau of Land Management (BLM) as the Alabama Hills Recreation Area. The area is managed as a protected habitat for public enjoyment. In March 2019, the US congress, as part of the California Deserts Wilderness Act, redesignated the area as the Alabama Hills National Scenic Area. The rounded contours of the Alabamas contrast with the sharp ridges of the Sierra Nevada to the west. Though this might suggest that they formed from a different orogeny, the Alabamas are the same age as the Sierra Nevada. The difference in wear can be accounted for by different patterns of erosion. The Alabama Hills were named for the CSS Alabama, a Confederate warship deployed during the American Civil War. 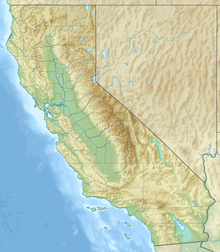 When news of the ship's exploits reached prospectors in California sympathetic to the Confederates, they named many mining claims after the ship, and the name came to be applied to the entire range. When the Alabama was finally sunk off the coast of Normandy by the USS Kearsarge in 1864, prospectors sympathetic to the North named a mining district, a mountain pass, a mountain peak, and a town after the Kearsarge. 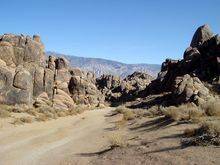 The Alabama Hills are a popular filming location for television and movie productions, especially Westerns set in an archetypical "rugged" environment. Since the early 1920s, 150 movies and about a dozen television shows have been filmed here, including Tom Mix films, Hopalong Cassidy films, The Gene Autry Show, The Lone Ranger and Bonanza. Meanwhile Classics such as Gunga Din, The Walking Hills, Yellow Sky, Springfield Rifle, The Violent Men, Bad Day at Black Rock (1955), the Budd Boetticher/Randolph Scott "Ranown" westerns, part of How the West Was Won, and Joe Kidd. In the late 1940s and early 50s the area was also a popular location for the films of B-western actor Tim Holt. More recent productions have been filmed at "movie ranch" sites known as Movie Flats and Movie Flat Road. Alabama Hills features exceptional skies for Southern California. It is Bortle class 2 or "average dark sky" site; this low level of light pollution meets or exceeds conditions in many of other popular nearby areas for amateur astronomy, such as Joshua Tree National Park (Bortle class 2-4). On a clear night with no moon, a visitor with good, dark adapted vision may see the Andromeda and Triangulum galaxies with the unaided eye; the central Milky Way appears highly structured under these conditions. ^ "Alabama Hills". ListsOfJohn.com. Retrieved 2012-11-16. ^ "Alabama Hills". Geographic Names Information System. United States Geological Survey. Retrieved 2012-11-16. ^ a b Kyle, Douglas E. and Hoover, Mildred Brooke (1990). Historic Spots in California, p. 122. Stanford, California: Stanford University Press. ISBN 0-8047-4483-1. ^ "Light pollution map". www.lightpollutionmap.info. Retrieved 2018-07-13. Geology Underfoot in Death Valley and Owens Valley, Sharp, Glazner (Mountain Press Publishing Company, Missoula; 1997) ISBN 0-87842-362-1. 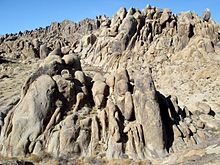 Wikimedia Commons has media related to Alabama Hills.